Growing up in a yurt on the outskirts of Ulaan Baatar, Mongolia, Suman Barkhas began training in yoga at age 13, when a visiting monk offered instruction. "He taught us about life, spirituality, and healing," Suman relates. "I was inspired to take that path." After travels in China, where he learned Tai Chi and Qigong, Suman trained to be a yogi monk at an ashram in Varanasii, India, beside the holy River Ganga. Afterwards, he was posted to many locations, from Southeast Asia to Northern Europe. "I traveled throughout Scandinavia," he says, "wherever people had an interest in spirituality." Suman arrived in the US in 2001, discovered Eugene the following year, and decided to settle here. 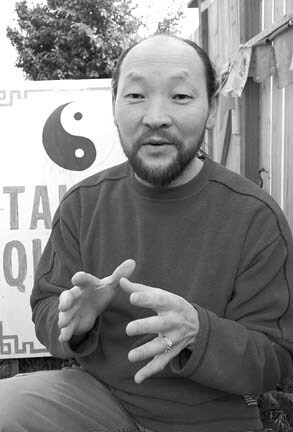 He currently teaches Tai Chi, Qigong, meditation, and yoga therapy at community centers in Eugene and Springfield, and at his home studio, Shantalaya - Abode of Peace. "I have 30 classes a week this winter," he says. For the fifth year, Suman is organizing a World Tai Chi and Qigong Day event at LCC on Saturday, April 26. For more information, visit shantalaya.com or call 688-2688.